Marvel’s second movie about the Avengers titled Age of Ultron is out in the theatres and the company shook hands with Samsung for some special projects. After teasing the Iron Man-themed Samsung Galaxy S6 edge last week, the Korean giant has formally launched it for select markets. This limited edition Galaxy S6 edge bears the same internals as the regular variant with 64GB of storage. It has been given the Iron Man look with red colored front and back, and gold colored metal frame. 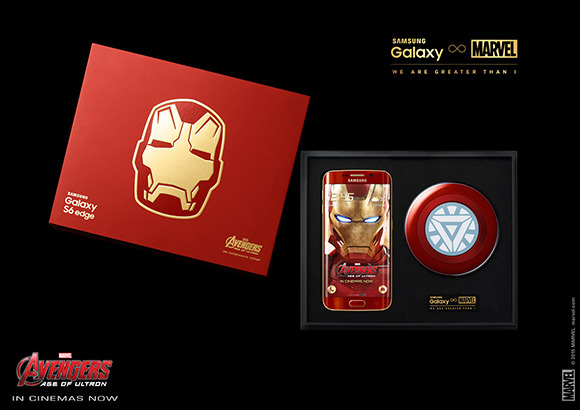 The phone will have a custom Avengers theme pre-installed and will be packaged in a limited edition Avengers box. Samsung has packed an arc reactor-themed wireless charger in the retail package. The latter will also contain a clear protective cover. The tricked out smartphone will be available in Korea on May 27, with China and Hong Kong in line to get it in June. finally the iron man edition! just got it.